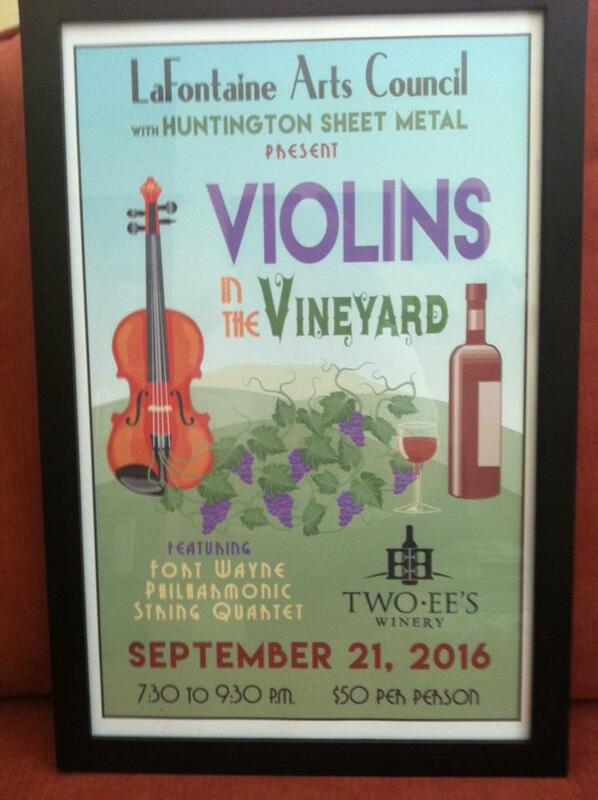 The LaFontaine Arts Council, in partnership with Huntington Sheet Metal, will present “Violins in the Vineyard” from 7:30 to 9:30 p.m. on Wednesday, September 21. The event will be held at Two-EE’s Winery and will feature a string quartet from the Fort Wayne Philharmonic playing sounds from the 60s and 70s. In addition to the entertainment, sweet and savory appetizers and two wine tastings are included in the $50 ticket price. Tickets are on sale now and can be purchased from LAC executive director Debbie Dyer by calling (260) 358-0055. LAC board member Adam Drummond will also have tickets available at the United Way of Huntington County office at 356 W. Park Drive during business hours.